Last month, Ilva whipped us back to basics. This month we’re plunging back even further and making the bread with our hands. Some weeks ago, when we got anardana, I wandered around the internet to find what people made with it. In my wanderings, I discovered a Persian-style kebab. 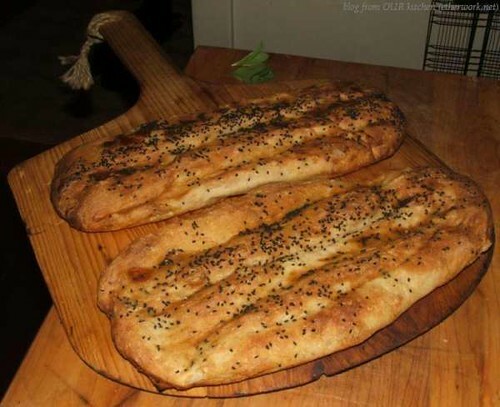 And along with the kebab, I learned about the most wonderful looking ridged golden flatbread, nan e barbari. Perhaps the most famous and widely used bread in Iran, Barbari is a part of Iranian culture. A piece of Barbari with some feta cheese and a cup of tea form the traditional breakfast in Iran. The secret behind the golden color of Barbari and its unique smell is in the small amount of baking soda mixed with some water and used to brush Barbari before baking. This mix is called Romal. I love the shape. I love the colour. Let’s face it. I love this bread. 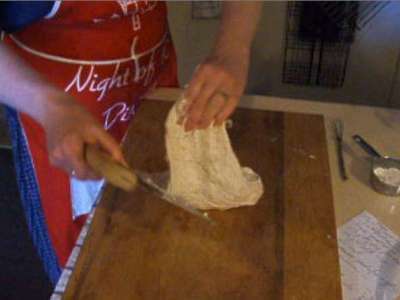 shaping: To shape the bread, one first forms a ball and then after a resting period, puts in ridges with the fingers. sauce (Romal): Apparently, the real secret to success is to brush the bread with a baking soda (bicarbonate of soda), flour and water wash just before baking it – although there is some controversy amongst the BBBabes about the baking soda. Omit the baking soda, if you find that it seems to add a chemical flavour to your bread. You’ll still have really great bread; it just won’t be quite as aromatic. butter – or lack thereof: (Hey!! That’s three!) Unlike Indian naan, this Persian bread dough has no butter, milk or yoghurt in it. 4 May 2013, 17:46 Ha! You should have heard me earlier today when I was kneading the dough and screaming that it was looser than the croc. In fact, it wasn’t dough at all. It was batter. Why? Because I’m an idiot. I reduced the recipe by half and then cleverly added the full amount of water with the reduced amounts of everything else. Luckily, I remembered before letting myself haphazardly dump in more flour. Instead, I threw the correct amount of flour and some extra salt onto the board and kneaded it all in. The dough is still pretty loose but it feels great! 16:17 Whoa! That’s loosey goosey. But, in spite of my fears, stretching each ball into long thin discs wasn’t tricky at all. 18:17 After slathering the shaped breads with sauce (Romal), I ALMOST threw on sesame seeds. I even had the sesame seed jar open. And then at the last minute, I suddenly switched to nigella seeds. 5 May 2013, 02:17 This bread is amazing! I love the flavour that the sauce adds. In fact, we’re thinking we should use this sauce on all bread. It’s slightly sweet (I guess from the baking soda) and incredibly aromatic. As I was hand-kneading the dough, alternately scraping & folding over, Bertinet lifting & plopping down, or wringing and twisting, I was looking out the window and admiring all the green leaves shining in the morning sun and listening to the birds sing. (I love a good run-on sentence, don’t you?) It was lovely, in spite of the fact that my hands were covered with dough. I love the sound of the dough slapping down on Richard Bertinet’s ‘lift, flip, plop’. There is just a nice satisfying *plop* as the dough hits the board. Today, I made sure to really stretch the dough towards me before folding it back onto itself and then scrabbling it up to lift, flip and plop down once more. And I got to thinking. If I’m not afraid to mix this 87% dough by hand, why am I so afraid of the croc? It can’t be this high in hydration can it? I just looked at the recipe and see that I’m right. The croc can’t be that high in hydration. It’s even higher! It’s 97% hydration!! 97%!! Eeeeek. No wonder I was afraid of the croc. I’m still afraid. However, I might just be crazy enough to try it one more time. But later. When the barbecue isn’t calling to us to make Persian style kebabs with mint (and maybe some anardana too?? ), lentils, grilled eggplant, salad and Nan-e-barberi. [T]he baking soda on top made my bread taste slightly chemical. I confess that we didn’t notice any chemical flavour at all. I wonder if it’s a difference in what kind of baking powder and/or baking soda we get in Canada. I too wondered about the baking powder but simply included it obediently because the recipe I was using called for it. Commercial baking powder preparations often contain undesirable ingredients (such as aluminum compounds). I suspect the baking powder could be left out and nothing bad would happen. But. I wouldn’t leave out the baking soda/flour/water wash. I think the baking soda makes a huge difference. But maybe it would be safe to cut back on the amount of baking soda? 15 June 2013 08:35 As an experiment, I slathered last night’s fougasse with sauce made with just flour and water. It made the bread a lovely colour but the amazing aroma wasn’t there. That clinches it for me. Whenever I make this Persian Flatbread, I will definitely include the baking soda in the sauce. This is a same day bread. In our 20C kitchen, I mixed and kneaded the dough at around noon. It was ready to shape at about 18:00. Mixing the dough ³ Pour the water into a largish bowl. Whisk in the yeast. Kneading Turn the dough out onto an UNfloured board. Wash and dry the mixing bowl. Please do not be tempted to skip this step. Prepare the sauce Whisk flour, baking soda and water in a small pot. Bring it to a boil. Remove from heat and set aside to cool. Final Shaping Brush each round with the sauce. Dip your fingers in the sauce and dimple the rounds down to form two ovals with lengthwise furrows. Brush ovals with the sauce once more and sprinkle with nigella seeds. Allow the ovals to stand for about 45 min. baking 4 Put a stone into the barbecue and preheat it to high. Before putting them onto the stone, pull each oval with your hands to lengthen it. Wet your hands so they won’t stick to the ovals and pull the dough from the bottom with your palms facing downwards. Put the lengthened ovals onto the hot stone (include the parchment paper). Move the stone over to cook the bread on indirect heat. Close the barbecue lid. Every so often turn the bread around to account for uneven heat in the barbecue. (Remove the paper if it’s convenient.) Cook the bread until it is golden (about 15 minutes). 1.) Water: Please do not use water from the hot water tap. Instead, heat the water in a kettle or microwave (to create lukewarm water, add cold water until it is the correct temperature of 90F (32C). If you are allergic to using a thermometer, you can do the baby bottle test on the back of your wrist.) Please note that before the yeast is added, the water temperature must be BELOW 120F (49C) because yeast begins to die when the temperature is higher than 120F. 2.) Baking Powder and Baking Soda: Some of the other BBBabes said they detected a chemical flavour from the baking powder and/or the baking soda. If you’re worried about it, it’s probably safe to omit them entirely to let the yeast do all the leavening and the flour and water in the sauce (Romal) do all the caramelizing. However, the baking soda (bicarbonate of soda) really does add a wonderful aromatic dimension to the bread. 3.) Mixing: I always mix by hand, because we don’t have an electric stand mixer. If you usually use your stand mixer to mix and knead, go to town and do so. But bear in mind that making this bread by hand is not only traditional, but it’s dead-easy and may well add flavour. Lida notes that if you are using a bread machine, you should add the main ingredients in the order suggested by your bread machine manual and continue to follow the manual instructions for mixing and kneading the dough. Then skip to step 6. If you are determined to get your money’s worth out of your electric stand mixer, I suspect that at least one of the other BBBabes has left instructions on her site about how to mix and knead using the machine. 4.) Baking: If you do not have a barbecue, this bread can be baked in a conventional oven. Lida suggests baking it in a preheated 375F (190C) oven for about 30 minutes until golden brown. We could not believe how fabulous this smelled as T pulled it out of the barbecue! We had the most amazing dinner of stir-fried cabbage, dahl, Persian-style chapli kebabs made with anardana, all garnished with coriander leaf and hot hot hot red chillies. We vowed that we would be making this bread all the time. And then it got cold and rainy again until early June when we made the bread again. It was easily as fabulous as the time before. Yes, indeed it’s worth the effort to go back to basics. This bread is a keeper. I hope you like it as much as we do! I have the honour of hosting June 2013’s Bread Baking Babes’ project. And I hope that you too would like to join us this month by plunging your hands into the dough to make this wonderful Persian bread! Last month, Ilva talked about going back to basics. Okay, BBBabes, let’s really go back to basics. Put your KAs, mix masters and bread machines away. I urge you to make the June bread by hand. It’s dead-easy. Really it is. And after all, this bread has been made by hand for eons. It tastes better that way. To receive a Baking Buddy Badge to display on your site: clean off your board, wash your hands to make Nan e Barbari (Persian Flatbread) in the next couple of weeks and post about it – we love to see how your bread turned out AND hear what you think about it: what you didn’t like and/or what you liked – before the 28 June 2013. If you do not have a blog, no problem; you can also post your picture(s) to Flickr (or any other photo sharing site) and record your thoughts about the bread there. Please remember to contact the Kitchen of the Month (hey! that’s me!!) to say that your post is up. leave a comment on this post that you have baked the bread, leaving a link back to your post. If you don’t have a blog or flickr-like account, no problem; we still want to see and hear about your bread! Please email me with the details, so your Nan e Barberi can be included in the roundup too. edit 30 June: Take a look at the line up of BBBuddies’ Nan e Barbari. They’re beautiful! » pita, pita, who wants pita! This entry was posted in baking, BBBabes, bread - yeasted & unyeasted, bread recipe, food & drink, posts with recipes on Sunday, 16 June 2013 by ejm. Okay, while I liked this bread…I don’t know how often I’ll be making it going forward. I know I at least want to try it once more – using the barbecue. Mine definitely didn’t get the beautiful golden color that yours did. I do appreciate the different technique it took to make the loaves, though. Thanks for the challenge, Elizabeth. edit a few moments later… Ohhh, I see that you DID use the breadmaker to mix the bread. Perhaps if you do it by hand and forget the breadmaker, it will work out better. My dough was quite wet, so these “stripes” were not really visible, but they were nice breads just the same, I used black sesameseeds for the topping, love that! A BBQ-version would be amazing I think. Thanks for the challenge. This was fun to make and next time I will do the kneading by hand…and bake it in the BBQ. Will be making bruchetta today with the loaf I saved from the table…with a plum/balsamic topping, a sprinkle of blue chees and toasted walnuts. Thanks for the challenge! I tried asking this before (my comment didn’t work ;-(() What’s wrong with hot tap water? Back when I was baking bread weekly (because we couldn’t get decent bread – not here in France) I always kneaded by hand. Love the idea of cooking on the barbecue – flavor must have been wonderful! Water from the hot water tap sits festering in your hot water tank, leaching copper, lead, zinc, solder, etc. etc from the tank walls… the higher temperature causes faster corrosion. Of course, saying that it is unsafe to use water from the hot water tap might be an urban myth, but why tempt fate? Lead is rarely found in source water, but can enter it through corroded plumbing. The Environmental Protection Agency says that older homes are more likely to have lead pipes and fixtures, but that even newer plumbing advertised as “lead-free” can still contain as much as 8 percent lead. A study published in The Journal of Environmental Health in 2002 found that tap water represented 14 to 20 percent of total lead exposure. Scientists emphasize that the risk is small. But to minimize it, the E.P.A. says cold tap water should always be used for preparing baby formula, cooking and drinking. It also warns that boiling water does not remove lead but can actually increase its concentration. We also use filtered water – think of all the unused pills that people simply flush down the toilet…. Non, Non, Non…. It was the last time you commented about the hot water that the form was giving me grief – it’s been working like a little trooper recently. Katie, it’s not just the metals that might be in hot water tanks. It’s bacteria as well. Water tanks particularly, collect sediments overtime and are breeding grounds for bacteria. You might be thinking that bacteria cannot survive in hot water, but you need water above 165 degrees Fahrenheit to kill most bacteria. That’s why your meat thermometer recommends you cook chicken until that internal temperature is reached. On its website, the Department of Energy notes that, “Although some manufacturers set water heater thermostats at 140 ºF, most households usually only require them set at 120 ºF.” For each 10º drop in temperature, consumers can expect to see a three to five percent savings on energy use. Moreover, DOE points out, setting that thermostat to 120º could extend the heater’s lifetime by slowing the buildup of minerals and corrosion within it. In 2000, the Walkerton disaster had sent a wake-up call about the safety of Canada’s drinking water. While standards for domestic hot water must consider scald prevention, they must also address the broad spectrum of public health and safety issues. To minimize bacteria contamination, water must be stored at 60 C or higher. For example, temperatures under 50 C may increase the risk of Legionnaires’ disease, a form of pneumonia, due to bacterial growth in the tank. It might seem alarmist to insist on heating cold water from the tap, rather than to use hot water but I would rather take the tiny bit of extra time to heat cold water in a kettle. Thanks for choosing this delicious flat bread Elizabeth. I really enjoy eating it :). How late am I to say a big thank you for this one? We really really enjoyed this one. Soon as we’re around a BBQ grill I really want to try it out. And have a more traditional dinner with it rather than sandwiches; although we were super happy with the sandwiches it made. This is my third month to Buddy bake with the Babes. Thank you, Elizabeth, for an interesting recipe that definitely gave me some new experiences. After reading the comments, I used my KA, and then decided to try kneading by hand. Glad I did! I could really feel the gluten adding structure as I continued to knead. I was then able to form two balls. Thanks for another great learning opportunity–and some interesting fun for my husband, as he tried this totally new (for us) bread. I have a photo, but couldn’t attach it here. We LOVED this bread! My husband keeps asking me to make it again. Next time I will knead it by hand (I admit I am a lazy bread baker) though just for the thrill of it. Love the sound of baking it on the BBQ….